The magnificent Dudhsagar Waterfall is perched in the high peaks of the Western Ghats and is a sight to behold especially in the monsoons when it is in full and furious flow. From a distance, the waterfall appears like streams of milk rushing down the mountainside. The exuberant and spectacular waterfall is located in the Sanguem taluka. Measuring a mighty 600m from head to foot, this waterfall on the Goa-Karnataka border, attracts a steady stream of visitors from the coast into the rugged Western Ghats. After pouring across the Deccan plateau, the headwaters of the Mandovi River form a foaming torrent that splits into three streams to cascade down a near-vertical cliff face into a deep green pool. The Konkani name for the falls, which literally translated means “sea of milk”, derives from clouds of milky foam which rises up at the bottom of the falls. Dudhsagar is set amidst breathtaking scenery overlooking a steep, crescent-shaped head of a valley carpeted with pristine tropical forest, that is only accessible on foot or by train. Like most places in Goa, the Dudhsagar waterfall too has a legend attached to its name. The legend tells the story of this powerful and wealthy king who ruled a kingdom in the Western Ghats. His lavish and opulent palace in the hills was surrounded by vast gardens which were full of deers and gazelles. Thus was the legend born. The sugared milk (dudh) poured down the mountainside and continued to flow in torrents as a tribute to the everlasting virtue and modesty of the Princess of the Ghats. The Dudh Sagar (Sea of Milk) continues to flow to this day and attracts thousands of visitors to one of the most popular and famous tourist spots in the state of Goa. Getting there: There is no direct way to reach Dudhsagar, you gotta take a train to Londa junction. From there, you need to take a local bus/taxi/train to either Kulem OR Castle Rock. This takes roughly 3 hours. The trek starts from here, a trek on track for over 12 kms to reach the waterfalls (Detailed options on trains from Bangalore are added at the bottom). The best time to visit is towards the end of the monsoon, when the fall has abundant water, and it’s relatively easier to trek once the rains are over. Trek from Castle Rock station is about 14 kms and about 12 kms from Kulem station. Both these routes require you to walk through winding railway tracks, walking into small waterfalls and cross dark tunnels. 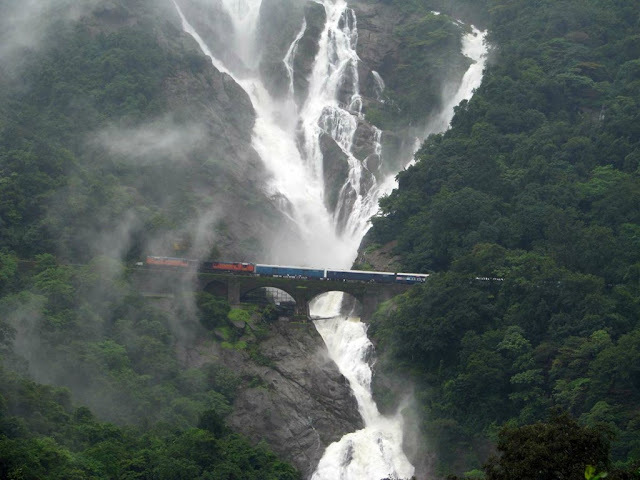 Dudhsagar Waterfall is the one you can hardly resist visiting. It is the 3rd tallest waterfall in India. This ‘Sea of milk’ is situated in Goa and is an hour and 15 minute drive from Panaji, the state capital.